Inshore Fishing Charters Tampa, FL - Interesting Experiences! Join an experienced captain for a day spent on one of Florida’s most productive natural estuary. Covering over 398 miles at high tide, Tampa Bay is the largest natural estuary in the state. Fishing here is prime, where saltwater and freshwater mix, making it the perfect place for all types of creatures. Its calmer waters and natural bottoms function as the nurseries of the underwater world. Grouper, Snook, and Redfish abound in this basin, and your captain is sure to know just where to find them. As with all Monster charters, your inshore fishing expedition includes all the equipment you'll need for an unforgettable day on the waters of the Gulf of Mexico. All you need to complete the package is a hunger for adventure. 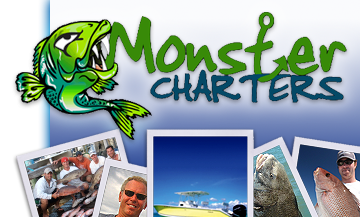 To receive more information on inshore fishing charters leaving Tampa, Florida contact Monster Charters today!